Feet bear the brunt of daily working life. Many workers face problems with their feet or legs because of the wrong footwear or because they are forced to stand for too long – and that’s without even considering direct hazards that workers may be exposed to, such as falling objects, sharp objects, slippery surfaces, moving machinery, electrical contact, and abrasives. It is estimated that around 80% of the adult population has some form of foot problem. This can vary from aches and pains, swelling and corns to fungal infections and varicose veins. While not all of these are a result of work activities, large proportions are. Our feet are exposed to many dangers at work and, like every other danger, the risk can be avoided or removed if employers take simple straightforward steps to protect their workers. To ensure the greatest possible protection for employees in the workplace, the cooperative efforts of both employers and employees will help in establishing and maintaining a safe and healthy work environment. 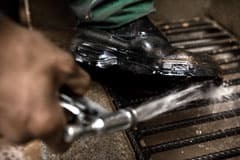 The employer must ensure that each affected employee uses protective footwear when working in areas where there is a danger of foot injuries due to falling or rolling objects or objects piercing the sole, and where such employees' feet are exposed to electrical hazards. The employer must ensure that the employee is instructed and trained in the proper use and care of the protective equipment. Managers and supervisors are responsible on a day-to-day basis for ensuring the implementation of a safety code for the staff within their control. Employees should consult their supervisors, however, regarding department-specific policies. Furthermore, employees have personal responsibilities to ensure the effectiveness of any safe system of work provided. They have to ensure that PPE provided is used, maintained and cleaned in accordance with the training, instruction and information received and used for official purposes only. There are many international standards that regulate protective footwear production and selection. The American Society for Testing and Materials (ASTM) has announced two new standards, titled F2413-11 Standard Specification for Performance Requirements for Foot Protection, and F2412-11 Standard Test Methods for Foot Protection. The American National Standard Institute (ANSI) articulates standards for personal protection including protective footwear. The ANSI Z41 standard defines performance measurements and test methods for protective footwear. Effective with the last revision of this standard, the ANSI Z41-1999 requires suppliers and manufactures of protective footwear to have independent laboratory test results available to confirm compliance with the standard. Occupational Safety and Health Administration (OSHA) sets regulations in the USA for health and safety including foot and leg safety. It is covered under the Code of Federal Regulations 29 CFR 1910.136 that refers to the ANSI and ASTM standards mentioned earlier. The Canadian Standards Association (CSA) engaged in standards development and certification activities. CSA Standard Z195 for protective footwear covers the design and performance requirements for protective footwear, including toe protection, sole puncture protection, electric-shock resistant soles and other requirements relating to metatarsal protection and general stability of the footwear. Australia/New Zealand Standards Committee prepares standards for occupational health and safety to be applied in Australia and New Zealand. Standard AS/NZS 2210.1:2010 sets out the recommended practices for the selection, care and use of safety, protective and occupational footwear. It also includes the hazards associated with the use of such footwear. The European Standard EN ISO 20345:2004 specifies basic and additional requirements for safety footwear. The standard was approved by CEN (European Committee for Standardization). The European Standard exists in three official versions: English, French and German. This standard is adopted and applied in the UK by the Health and Safety Executive (HSE). The Singapore Standard (SS) 513:2005 (ISO 20345:2004) was prepared by the Technical Committee on Personal Safety and Ergonomics under the purview of the General Engineering and Safety Standards Committee. This standard, comprised of Part 1 and Part 2, supersedes SS 105: 1997 – ‘Safety footwear’. Part 1 specifies basic and additional (optional) requirements for safety footwear and Part 2 specifies methods for testing footwear designed as personal protective equipment. Most of the major manufactures of protective footwear comply with one or more of the above-mentioned standards depending on the areas and markets in which its products are available. To make sure the right type of PPE is chosen, consider the different hazards in the workplace and identify the PPE that will provide adequate protection against them, which may be different for each job. Ask your supplier for advice on the types of PPE available and their suitability for different tasks. In some cases, you may need to get advice from specialists or from the PPE manufacturer. • A heavy object falling or large animal stepping on the foot • A heavy object rolling over the foot • A sharp object penetrating the sole of the foot or cutting through the top • Ignition of flammable or explosive vapours or dusts from static electricity discharged between the foot and walking surface • Accidental contact with low voltage (50V - 600V) live electrical systems • Contact with high voltage systems • Chainsaw usage or similar cut hazard • Contact with chemicals, potentially infectious human bodily fluids, or human pathogens • Molten metals splashing on the foot • Slips or falls due to wet / slippery surfaces or rough terrain • Environmental conditions e.g. extreme heat/cold, bites from venomous snakes etc. Nonetheless, the biggest risk probably comes from slips and trips. This can be caused by inappropriate footwear, but often the problem is not just with the footwear but the actual surface. Employers should make sure that floors are kept clean and dry and, where that is not possible, special flooring may need to be installed. These requirements will ensure that the selected protective footwear will stand one or more of the hazards mentioned before. The proper footwear with the required specification should be selected based on the related hazard or risk the user faces. Some details of each requirement will be specified hereunder. Toe impact rating Safety shoes or boots with impact protection are required when carrying or handling heavy materials/objects such as packages, parts or heavy tools, which could be dropped or fall onto the feet and cause serious injury. Toe compression rating Safety shoes or boots with compression protection are required for work where a heavy object or item may roll over the toe e.g. operating skid trucks and pallet jacks, working around bulk paper rolls or heavy pipes, etc. Metatarsal protection Safety shoes with metatarsal protection protect the bones of the upper foot from compression and impact. Puncture or penetration of footwear sole Safety shoes or boots with puncture protection are required when there is risk of sharp objects such as nails, wire, tacks, screws, large staples, scrap metal etc. penetrating the sole of the shoe. Protection is gained by the addition of a built-in puncture resistant plate that is positioned between the insole and outsole. Chainsaw use This type of footwear provides cut resistance to the feet in addition to the puncture resistant sole while operating a chainsaw or device with similar hazard. The higher boot style is designed to protect the feet between the toe and lower leg. Electric shock This type of footwear is constructed with non-conductive electric shock resistant soles and heels so that the outsole provides a secondary source of electric shock resistance protection to the wearer. Electrical conduction Safety shoes with electrical conduction rating are intended to provide protection against the build up of static electricity between the shoe and walking surface in areas where such static could serve as an ignition source for explosive or flammable vapours or dusts. Static dissipation This type of shoe is often used when working on or constructing sensitive electrical equipment. They are designed to prevent the build up of static electricity which can damage electrical components, but also to provide a level of shock protection to the wearer should they inadvertently come in contact with a live electrical system. Dielectric insulation This type of footwear is commonly found as an overshoe and is designed to provide the wearer with additional insulation if accidental contact is made with energised electrical conductors, apparatus or circuits, usually in a wet environment. A lot of problems are caused by inadequate footwear. Work in any environment where there is a risk of slipping requires slip-resistant shoes. Where there is the risk of a shoe being crushed or hit by an object, or even caught in machinery, safety footwear must be provided. If there is the possibility of standing on nails or other sharp objects then the employer must provide puncture resistant soles. Even if safety footwear is not required the employer should give advice on appropriate footwear. Workers should be able to wear the footwear that is appropriate to their occupation, working environment and feet. That means employers should ensure that the risk assessment they have to do by law includes risks to the feet as well as slipping risks, and if safety or special footwear is required they must supply it at no cost to the worker. Wherever special footwear is provided the employer must make sure that it fits properly and should allow the toes wiggle room – around a 1cm gap between the longest toe and the end of the shoe. There should also be a choice of shoes, and worker representatives should be involved in choosing which ones are offered. This will help ensure that workers wear them. Comfortable, properly fitted footwear is essential to maintaining good foot health. Many minor foot ailments can be relieved with properly fitted and carefully selected shoes. Always have both feet measured because they may not be the same size. When choosing shoes, the length, width and depth of the shoes are important. Always try on both shoes. Ensure there is enough room at the front of the shoes to allow for the natural movement of your toes when walking – your toes should be able to wiggle. When choosing new shoes, take time to test them out, and walk around to ensure maximum comfort. Don’t break in new shoes. Shoes that fit well should feel comfortable. As you get older, your feet tend to get larger, so get them measured periodically. A good fit doesn’t necessarily mean high expense. There are other considerations that should be looked at when selecting protective footwear that may not be covered under international standards, such as slip resistance, ankle protection, chemical permeability, and biological agents. Slip resistance The following work environment factors may affect slip resistance: type of surface material; smoothness of the walking surface; wet or dry surface; type of liquid on the surface; temperature of the surface and the surrounding air. In general, smooth and/or wet surfaces are more slippery. Ankle protection Lace-up boots that cover the ankle and provide support are recommended when the user will be navigating rough/uneven terrain, or riding horses, ATVs, or motorcycles. A boot style also provides protection to the ankle and calf (depending on boot height) if animal bites or contact with poisonous plants or animals is a recognized hazard. Chemical permeability In general, disposable shoe covers or impermeable boots will be necessary to protect against contact with hazardous chemicals. The manufacturer will provide permeability data based on the material of construction. The selected shoe cover or boot must be resistant to the chemicals of interest. Biological agents Disposable shoe covers or rubber-like boots may be used when there is risk of contact with biological agents, as this will help with the ease of disinfection. The material of construction must be compatible with specified disinfectants. 1. The upper should be made from natural materials such as leather or a breathable manmade fabric. Some leather has a plastic coating to repel water and allow the shoe to be wiped clean. 2. The lining should be a breathable material to keep the foot fresh. Linings need to be smooth and seam-free. 3. The toe area should be foot-shaped and deep enough to prevent rubbing and allow the toes to wriggle. This is especially important with protective toecaps. If the shoes are padded and fitted properly, you should not be able to feel the toecaps at all. 4. Insoles should preferably be removable to allow easy insertion of padding or orthotics. 5. The heel should fit snugly on the foot, stopping the heel slipping out of the shoe and stabilising the foot upon ground contact. 6. The heel should have a broad base and be no higher than 4cm. If worn for long periods they should be no more than 2cm in height. 7. The sole should be strong and flexible with shock absorption to cushion the jolts from walking on hard surfaces. Material should be slip resistant, such as rubber, polyurethane or PVC. 8. Suitable fastenings include laces, buckles or Velcro to secure the foot in the shoe. The importance of proper footwear goes well beyond just appropriate safety footwear. In fact it is important in every worker’s life that staff are encouraged to wear ‘sensible’ and appropriate footwear. Many occupations will have different footwear requirements, but in almost all of them there is a need for a good fitting supportive shoe. Some shoes are less appropriate than others and may cause problems. Slip-ons, for instance, are less suited for daily use than shoes with straps or lace over the insets, because the foot is more likely to slide forward in the shoe.